At least 113 were killed and injured Monday in three separate bombings in different parts of Iraqi capital city of Baghdad, media reports said. According to a report by IFP, the first attack on Sadr City, a Shiite-majority suburb of Baghdad, took place shortly after the arrival of French President Francois Hollande, who was in Baghdad for meetings with Iraqi officials and would be visiting French troops in the north of the country. Many of the victims were daily labourers waiting for jobs at an intersection in Sadr City, a sprawling majority Shiite neighbourhood in the northeast of the capital that has been repeatedly targeted. Pictures posted on social media shortly after the explosion showed a huge plume of black smoke billowing into the sky and seriously injured people being evacuated. 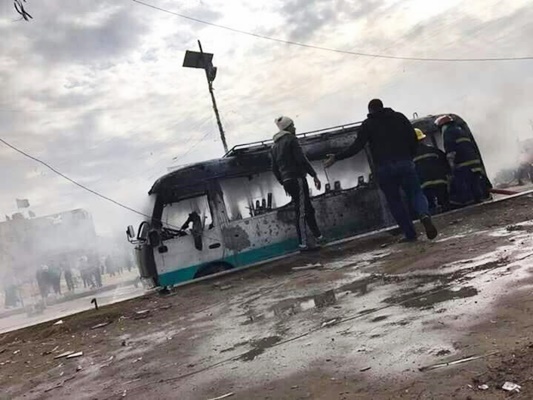 Later in the day, an official from the Iraqi Interior Ministry confirmed to Rudaw that an explosion went off near Jawadir hospital, shortly after the first attack in the Sadr district, killing 11 others. Another seven people were killed and wounded in a car bomb nearby Kendi hospital in central Baghdad, bringing the total number of the casualties to 113 in a single day. The police source said the number of casualties is on the rise. The ISIS terrorist group has claimed responsibility for these three attacks in Baghdad. Over the past few days multiple bombings have ripped through Baghdad and Shiite Najaf city, killing another 35 civilians. These attacks come as Iraqi forces have been engaged nearly three months in a major military offensive to retake the city of Mosul from the extremist group ISIS.